Department of Education University of Haifa, Haifa, Israel. Received May 22nd, 2011; revised July 19th, 2011; accepted August 22nd, 2011.
the processing of information (words, drawings, etc.) according to specific task requirements or task constraints. quirements rather than inherent characteristics of stimuli. their imagery features and the other to their verbal properties. such a dual coding theory, as well as to elucidate its constraints. & Roediger, 1987; Wippich, Melzer, & Mecklenbrauker, 1998). 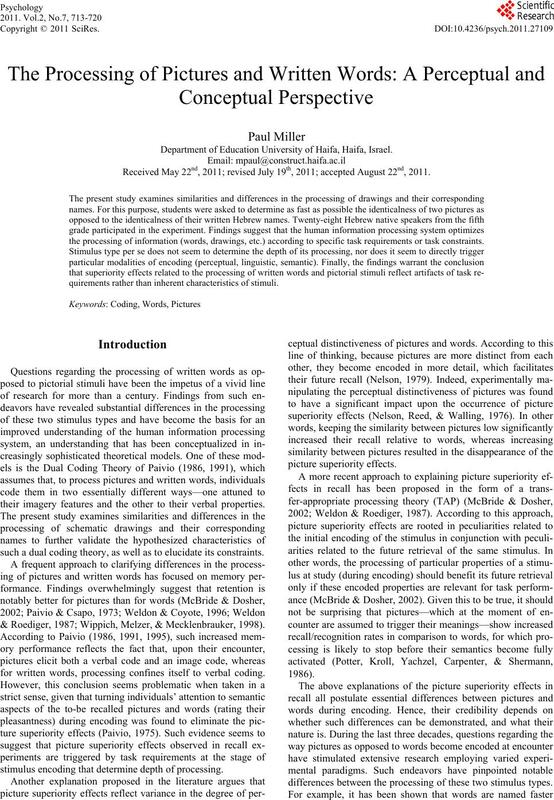 for written words, processing confines itself to verbal coding. stimulus encoding that determine depth of processing. differences between the processing of these two stimulus types. opposite was the case (Job, Rumiati, & Lotto, 1992). a part of accessing its meaning, rather than subsequent to it. The paradigm manipulated two basic processing dimensions. stimulus pair must be processed beyond the perceptual level. item names should impact the speed of their processing. × 2 (syllabic length—monosyllabic vs. bisyllabic). 1992; Job & Tenconi, 2002). fields, arranged in five rows on an A3 sheet (see Appendix A). served for task explanation and practice. tions, except that drawings were used to build the stimulus pairs. stimulus pairs of the four word conditions of the experiment. create the four drawing conditions of the experiment. 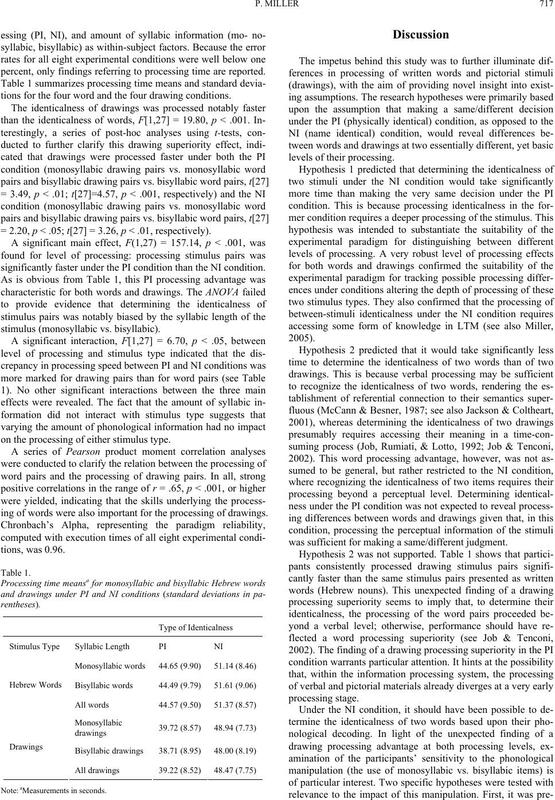 drawing conditions, two drawings were produced for each noun. the stimulus pairs in the four drawing conditions. flashcards representing the same object being put into one pile. manifested problems understanding the task requirements. participants not to make corrections in case they err. stopped when the participants marked the last stimulus pair. all eight experimental conditions (test sheets). 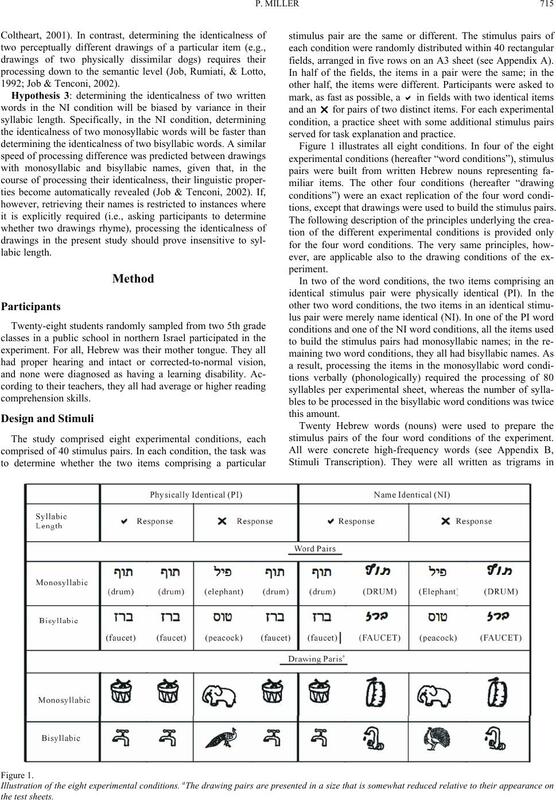 regarding pointed and unpointed Hebrew, see Shimron, 1993). 2Hebrew is read from right to left. 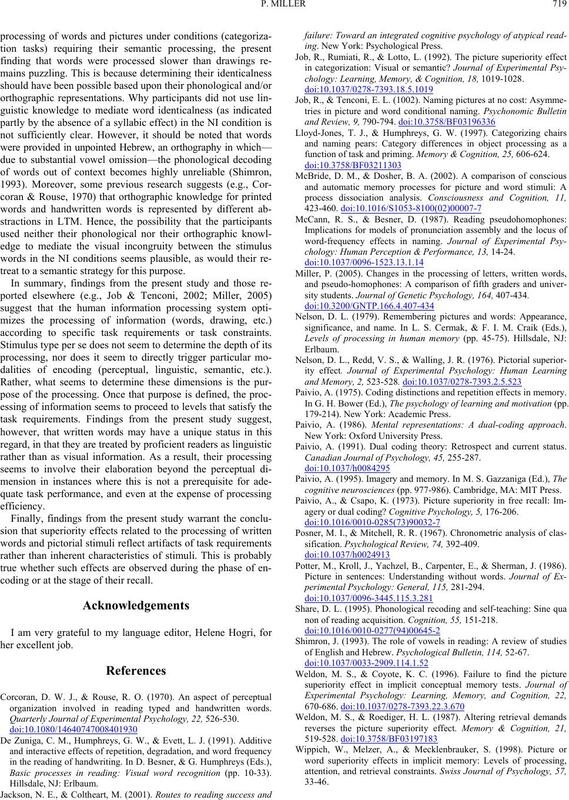 percent, only findings referring to processing time are reported. tions for the four word and the four drawing conditions. = 2.20, p < .05; t = 3.26, p < .01, respectivel y). significantly faster under the PI condition than the NI condition. on the processing of either stimulus type. ing of words were also important for the processing of drawings. Note: aMeasurement s in sec ond s.
was sufficient for making a same/d ifferent jud gment. processed significantly slower than monosyllabic word pairs). (e.g., Paivio, 1986; see also Share, 1995). 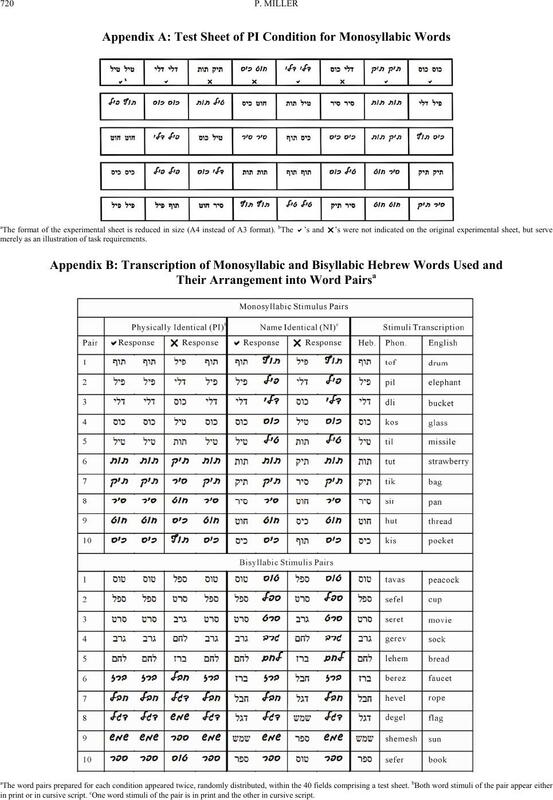 of a triple interaction of these effects with syllabic length. the most basic processing levels. hinder them from processing the PI condition at a deeper level. may not be tenable in its narrow sense. superiority in the PI condition is warranted. instances where it is purposeful for task performance. treat to a semantic strategy for this purpose. according to specific task requirements or task constraints. dalities of encoding (perceptual, linguistic, semantic, etc.). coding or at the stage of their recall. organization involved in reading typed and handwritten words. 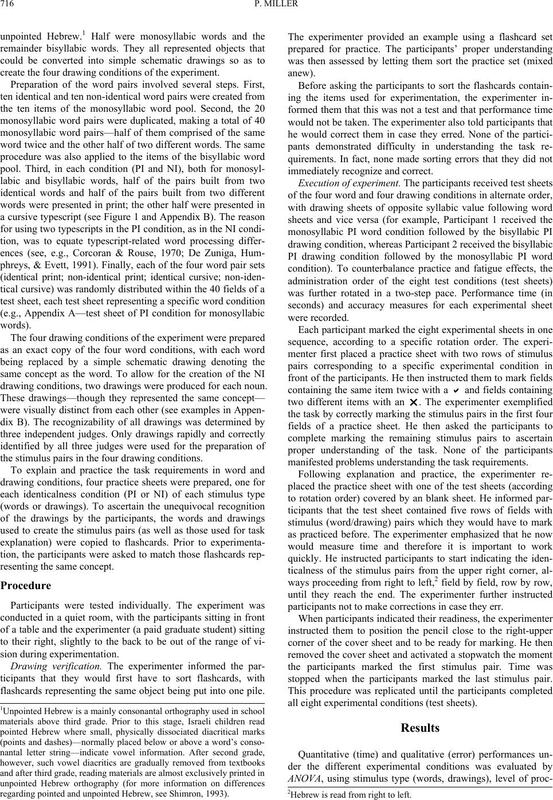 Quarterly Journal of Experimental Psychology, 22, 526-530. Basic processes in reading: Visual word recognition (pp. 10-33). ing. New York: Psychological Press. chology: Learning, Memory, & Cognition, 18, 1019-1028.
function of task and priming. Memory & Cognition, 25, 606-624.
chology: Human Perception & Performance, 13, 14-24.
sity students. Journal of G enetic Psychology, 164, 40 7-434. Paivio, A. (1975). Coding distinctions and repetition effects in memory. In G. H. Bower (Ed. ), The psychology of learning and motivation (pp. 179-214). New York: Academic Press. Paivio, A. (1986). Mental representations: A dual-coding approach. Paivio, A. (1991). Dual coding theory: Retrospect and current status. 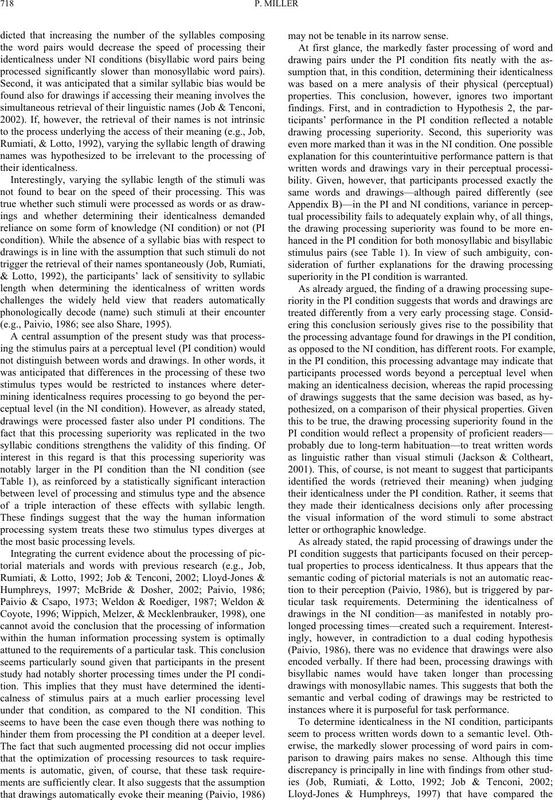 Canadian Journal of Psychology, 45, 255-287.
cognitive neurosciences (pp. 977-986 ). Cambridge, MA : MIT Press. agery or dual coding? Cognitive Psychology, 5, 176-206.
sification. Psychological Review, 74, 392-409. Potter, M., Kroll, J., Yachzel, B., Carpenter, E., & Sherman, J. (1986). 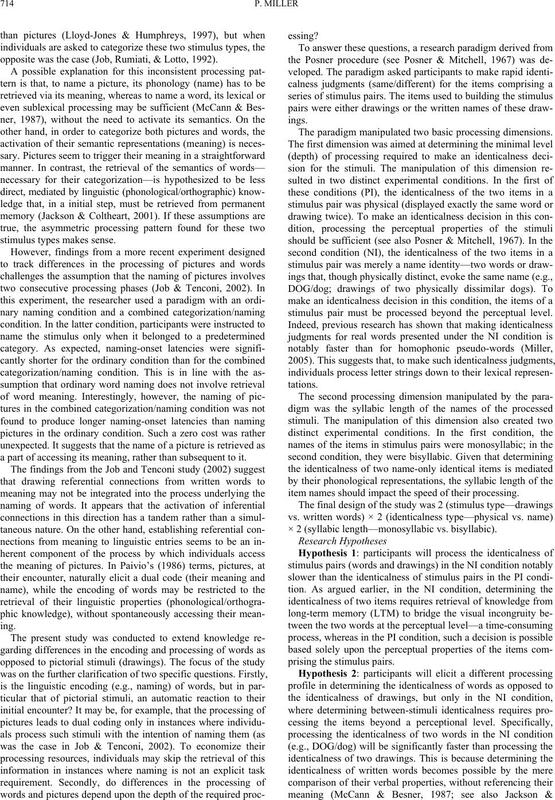 perimental Psychology: Gen er a l , 115, 281-294.
non of reading acquisition. C ognition, 55, 151- 218.
of English and Hebrew. Psy c ho l o g i c a l Bulletin, 114, 52-67.
merely as an i llustrati o n of task re q uirements . in print or in cursive scr ip t. cOne word stimuli of the pair is in print and the other in cursive script.